Been a while since I've done one of these, eh? Lucky for you, there's a bunch of good stuff happening this week and next! Firstly, I'm teaching my BEST EVER Beekeeping 101 Course at the Brooklyn Brainery, starting on the 23rd of February. I've been reading some fancy new literature and rejiggering some of my explanations, so expect to learn a lot of nifty information in nifty ways. 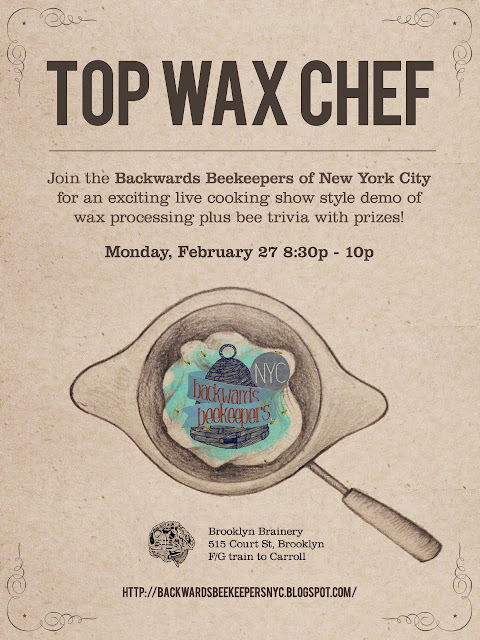 For those of you who have bees already or just have a passing curiosity, the Backwards Beekeepers of NYC are hosting a Wax Processing Demo at the Brooklyn Brainery on February 27th, starting at 8:30PM! Please join the Backward Beekeepers of NYC for a wax processing workshop! We will be doing a cooking show style demo plus bee trivia with prizes!! We will be covering all the live steps in rendering beeswax from the hive so it can be used in various applications, including candles, salves, furniture polish and starter strips for foundation on foundationless hives. Open to beekeepers and folks who would love to learn more! Continuing the excitment, Meg Paska, another co-founder of the Backwards Beekeepers of NYC is teaching Beekeeping 101 at TWO locations in March! If you have a sunny yard or rooftop and 15 minutes a week, you could be harvesting honey from your own bee hive! Learn the basics of first-year beekeeping, including honeybee anatomy and hierarchy, hive assembly, feeding, re-queening, and swarm prevention. This course is guaranteed to get you hooked on honeybees. Please bring lunch to the Saturday field trip. $213 for members, 191 for non-members. Beekeeping isn’t just for farmers anymore! Learn the ins-and-outs of keeping bees in an urban environment. Maintaining an apiary is easier than you think - all one needs is a relatively accessible rooftop with a lot of sun, 15 minutes a week and tolerance for the occasional sting. With some patience, you can harvest your own distinctive, local honey and contribute to the pollination of your community’s flora! In spite of what you might think, Honeybees thrive in urban areas like New York City. With an abundance of flowering trees and weeds, pollinators have their pick of as much nectar and pollen as any country bee might. In addition, they don’t come into contact with pesticides like rural bees do, so colonies tend to be healthier. In this class you will learn about honeybee anatomy and behavior, hive function and construction, neighborly relations, urban beekeeping pros and cons, disease and pests, legality and safety and much more. You will leave this class with enough understanding and confidence to start your own colony in the Spring. What is the difference between Meg's class and mine you may ask? I'm not sure, but they both rock. Go to the one that's most convenient! Also, she is a girl.